Vancouver Canucks: ONE LAST TIME. Here we go…the end of an era has officially arrived. Are you ready, Canucks fans? To be honest, I don’t think I ever quite prepared myself for this day to actually arrive. The Sedin era is officially coming to a close and while my heart is breaking more and more as that reality sets in, it’s also full of pride knowing what they have given to the game of hockey. This week has one full of emotions all over the map. Elation from finally getting to meet two people who have defined what it meant to be a Canuck in every possible way. Shock in learning the news that they were leaving the game when the season comes to an end. A beyond grateful heart for the 18+ years that they’ve given everything they had to this city and this team. Nostalgia for the ever countless moments of Sedinery that captured us all and changed the way many players played the game. Content in knowing that this decision was made on their own terms and not because an injury made the decision, the future will be theirs to decide. In Vancouver, it’s the end of an incredible era that will long live on for the fans that watched the entirety of their careers and every player that they played with over those 18 years. The announcement though not entirely unexpected still took Canucks nation by storm. The city at times has been critical of their two Swedish superstars but with just TWO last home games to witness Sedinery, the city stormed to make sure that the Sedins were given a proper send off. The final game for the Sedins at Rogers Arena was perfection. Let me take a minute to describe to you the atmosphere which was all kinds of magic. My sister and I have partial season tickets, so we had our tickets to the final game long in advance before the retirement news broke. Our seats are in the upper bowl but with a great view of the ice and that was where we expected to witness this one last game of Sedinery instead we found out that we won the in arena seat upgrade to seats behind the glass! And can I just say, WHAT A VIEW for the end of what has been an epic chapter in Canucks history?! I will long remember every single sight and sound from that night. Walking into the arena on Thursday, you could feel a different energy, one that was no longer battling tanking or not tanking but rather one that was completely centered on celebrating that Sedins and everything they have meant to this city. For 18+ years they have defined the heart of the team. It was absolutely electric, almost a playoff like atmosphere and noise level in the arena from the warm ups all throughout the game. From the moment the puck dropped, every shift Henrik and Daniel were on the ice the cheers roared and the crowd was on their feet. (Myself, I’m fairly certain I was standing for pretty much the whole game.). I lost count of how many ovations we gave but it was quite a sight to take in with 18,000+ fans. For one night, we came together, dropped our different views and simply said thank-you to two players who as great of hockey players they were, were even greater people. Every shift they were on the ice, the alternating cheers: “HENRIK! DANIEL! HALL OF FAME! GO SEDINS GO! ONE MORE YEAR!” reached a new decibel. It really was all kinds of magic to be a part of and to witness. As has been the case many a time this season, the team fell behind by 2 goals heading into the 3rd period. On this night though, that didn’t seem to matter even a little. From the viking clap that led off the start of the final period you could feel something magic was still to come. You could feel the team wanting to complete the comeback and what a comeback it was. And those Sedin shifts in the third period? Oh yes the cheers got even louder hoping to see some Sedinery magic the Rogers Arena ice ONE LAST TIME. Rogers Arena was alive as the Sedins twin-tuition struck ONE LAST TIME. And it was all kinds of magic and picture perfect way for them to bid farewell to the rink they’ve called home since they made their NHL debut in 2000. As a Canucks fan, I feel beyond incredibly lucky have been able to witness countless memories of Sedin magic and their retirement probably won’t fully hit me until next season when they aren’t in the lineup for the season opener. It’s not often that fans have one, let alone two players play side by side for nearly two decades accumulating franchise records. They leave behind a legacy that will be hard to duplicate but be an incredible example of what it means to be professional both on and off of the ice. Shortly after they announced their decision to retire, there was a resounding of praise and awe from coaches, teammates, fans, former teammates, and yes even opponents. Along with those comments of thanks came those critics claiming the twins never accomplished anything in the game since they had no Cup to their name. Yes, it’s true that they never won a cup BUT that one fact does not erase the accomplishments they DO have in the game: world junior medals, world championship, Olympic medals, Art Ross trophies, Hart & Linsday trophies. Maybe some will still say they aren’t true winners but Canucks fans know beyond a shadow of a doubt that the Sedins forever changed the game of hockey, and the game will never be the same without them. Henrik and Daniel: Thank-you hardly seems enough, but it’s what we have to offer. Thank-you a million times for EVERYTHING. You defined the heart of the Canucks for 18 years and leave behind a legacy that many will try to emulate. Next up? Jersey retirement AND HALL OF FAME! It is absolutely mind boggling that after more than ten years in the league, the Sedins STILL do not have the respect that they deserve from the NHL, their peers, the media or the fans. The twins are constantly breaking records, defying odds and acting as pillars in the community while never letting it show if or when the outside negativity bothers them in any way. That is until recently as they have started to stand up for themselves on the ice and show this league that they are NOT soft but fierce competitors with determination in their every stride. Beyond the question of their toughness or their character, more recently the question has become is the league willing to protect it’s star players? The obvious answer should be yes, BUT sadly that is not always the case. This season alone has seen many players be on the receiving end of questionable elbows, knees, and hits from behind and many of those same hits go unpunished. The latest hit in question came when Henrik Sedin was hit from behind by Grabvoski late in the first period versus the New York Islanders. Grabvoski was given a five minute major and kicked out of the game while Henrik did not return to the game. It has yet to be determined how long he will be out of the lineup. Time will tell if the NHL will add this play to their review file or whether it will even warrant a suspension as the department of player safety has yet to be consistent in their dispensing of discipline league wide. If the player injured on the play in question was Toews, Crosby or Ovechkin, the league would not hesitate to review the play that injured a star player. So what will it take for the league to review a play that injured a Sedin? A shoulder injury as is rumoured to have sidelined Henrik or the next hit that could end his career? I guess we will find out in the next twenty-four hours or so how this situation unfolds. UPDATE: It appears that the NHL has once again decided to look the other way with no supplementary discipline rather than to protect one it’s players. All I can say is that I hope that it does not take a player’s career being ended due to a bad hit before the league decides to actually protect it’s players every single day no matter which name is on their jersey. The month of October and the Canucks usually do not go together or at least that’s story for the last 7 seasons or so. Octobers have statistically not been kind to the Canucks. Cue the hiring of head coach John Tortorella and everyone arriving at their own ideas of how this will go[many thought automatic disaster]. The schedule was released and featured a league high 9 games on the road including a LONG 7-game road trip in the middle of the month. 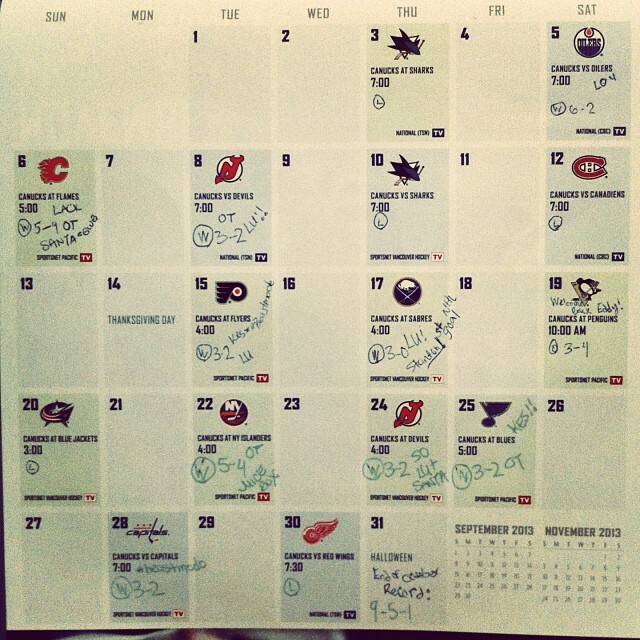 It seemed that the month was doomed before the first puck dropped. Based on history being against the Canucks, the injury bug and the road heavy schedule, most people did not have high expectations for the start of the season and many stated that they would be happy to just survive October with a 0.500 level. Torts made it clear from Day ONE that he hates losing and wanted to instill the will to win to all of the players. Torts changed the mindset that a lousy October is acceptable or expected but rather that you should put your best effort forward and not listen to the naysayers. -The 7-game road trip that scared fans saw the team pick up 11/14 points and post a 5-1-1 record. -The road trip saw the re-emergence of Ryan Kesler’s #beastmode who picked up 9 points on the road (he now has 11 points [8 goals, 3 assists]). -Torts plays everyone on the PK and expects everyone to block shots. Did I also mention that Torts has split the Sedins up more than once and nearly every time it yields results. -The unexpected signings of Mike “SANTA” Santorelli and Brad Richardson have looked very good representing the Canucks scoring some clutch goals. -Kesler was shifted from his usual position at centre to wing & has thrived. What month is that you say? Yes it’s true, October came & went with NO October blues. ONE LAST THOUGHT: 33 combined points in 15 games…CAN we re-sign the SEDINS already?! Why SO serious[again!]? & NHLPA says YES to RA! Is that panic I hear? Why yes, yes I think it is. It is hardly time to panic just yet. Yes, it is nearly the halfway mark of the season for every team but it is certainly not time to panic by any means. Yes the Canucks have gone 1-1-2 in their first 4 games of March [which means yes they have lost 3, but they have picked up points in 3 of those 4 games]. The Canucks still have 25 games left to play and personally, I think the best is yet to come! Henrik and Daniel have returned to their point per game status quo [remember how 8 games in people were asking what happened to the twins?! well they certainly are back on track aren’t they?]. The biggest blow to the Canucks so far this season was the loss of Ryan Kesler to a broken foot and Manny Malhotra being shut down for the year. In Kesler’s absence Jannik Hansen and Mason Raymond have stepped up their respective games with providing secondary scoring. Both have found ways to score and make some great defensive plays. Raymond has looked very good since being moved to centre but just needs a little work in the face off circle. It is nice to see that there are players in the line up able to put up goals on a more regular basis which takes the pressure off of the twins. The forwards combined through 23 games have put up 119 points[46 goals, 73 assists]. If Alberts is going to stay in the line up could he please not take terrible penalties or can we just put Ballard back in?! The defense definitely needs some work with Kevin Bieksa still out of the line up. Hopefully Juice[Bieksa] is back in the line up soon to give the Canucks a little more dependability defensively as they have lapsed slightly defensively in his 5 game absence. The defense has been solid at least offensively this season putting up 42 points[15 goals, 27 assists] combined in the first 23 games, that an average of 1.8 points per game[not bad hey?]. The Canucks will need to tighten up defensively as the stretch drive to the playoffs is right around the corner. Goal-tending controversy smontroversy! Take a chill pill people. You all lobbied for Schneider[6-4-3] to get the starting position and lobbied to send Lou[5-2-3] packing. How quick all the band-wagoners are to jump back on the #LUUUUUU train every time Schneids struggles. I do think that while Cory has earned the chance to prove himself, he has struggled to find any kind of consistency in this shortened season. Maybe he will find his bearings, maybe not, in the mean time can we please give LOU the chance that he more than deserves after everything this city of finicky fans have put him through? Here’s #Looking2LOUKID! I like BOTH goalies and think both are capable of helping the Canucks towards their end goal for the season, but Luongo has more than paid his dues with his never wavering patience this season and he too has earned his chance to play. Major news from around the NHL rink this last week was that the NHLPA finally gave approval of the re-alignment going into next season[2013-2014]. That is a HUGE boost moving forward with the re-alignment, and next it must be approved by the owners and the Board of Governors before it can be official. The re-alignment should it be approved by all parties will change and re-ignite rivalries new and old. It will be interesting to see how the NHL will address the playoff format with uneven conferences next year. Gone will be the 6 division/2 conference set up that is currently in place and in its place will be a 4 conference system. New details are sure to be released the closer to reality this becomes. Let’s hope that they have better names for the conferences than Conference A. B, C & D.
In other news, the Chicago Blackhawks FINALLY lost a game in regulation. It only took 25 games! As much as I cannot stand Chicago, that was sincerely an impressive run of 24 games[21-0-3] before their defeat in Colorado last night. Congratulations on achieving a record that will be extremely hard for any other team to match. Congratulations also to the Avalanche for being the team to break the streak! [P.S. I think Colorado is greatly benefiting from Ryan O’Reilly being back in the line-up as they have greatly improved offensively since getting him back last week!]. Now that the O’Reilly drama is settled with Colorado there is room for other signings. The biggest re-signing so far this season was announced just yesterday by Anaheim. The Ducks have re-signed Ryan Getzlaf to an 8-year $66 million extension[that’s an average of $8.25 million per year]. The question is now that they have invested the big money into Getzlaf’s contract, can they afford to keep Corey Perry who is also in line for a raise from his last contract. If they cannot afford to sign Perry the rumors are already swirling that they may move him the trade deadline[unlikely as that would greatly anger their fans] or he will test the waters of free agency in the off-season. Did you hear the Pronger news? He addressed the media for the first time on his post-concussion status. He may not be near playing condition, but he stated emphatically that he is NOT ready to hang up the skates just yet. That does not mean he will or will not play again, it just means he is still hanging on to a sliver of hope, and who can blame the guy for wanting to hold out for one more chance. Best of luck Pronger whatever your future may hold, you’ve had a heck a career! #MarchMadness has only just begun and the best of the season is yet to come! Are you ready? 23 games down for the Canucks, 25 more to go. #GoCanucksGo Best of luck in the final 25 boys! I look forward to seeing the boys live at Rogers when they return home this week to play Nashville on Thursday[3/14]! Kesler’s return delayed…Doan’s heart in Phoenix, but where will he play next season? Bad news bears. In the latest #Canuck news, it looks like Ryan Kesler will not be returning in early October…but rather early-mid December. I was hoping to see #17 lace up the skates for October…but as I mentioned before, I would much rather have Kesler return 100% recovered and fully ready to unleash his #beastmode for the rest of the year +playoffs(into JUNE..*fingers crossed*) and that means later than we all hoped. This latest update explains the pursuit of both (top 6 forward)Doan and (3rd line centre)Arnott as the Canucks are in need of both type of players to bolster the line-up without Kesler. Mind you a young Evander Kane would look great in the lineup too…with his skill-set, he could fill in the gaps with Kesler out and solidify that 3rd line. When one of a team’s best players is out of the the lineup for an extended period, it means that another player has to step up, with Kesler out of the lineup to start the year, that is exactly what it means. When Daniel Sedin missed 18 games in the start of the 2009-2010 season it was his brother who stepped up to lead this team(a year before he was named team captain!) with 18 points in that stretch, proving that he can play without his brother…he eventually went on to win the Art Ross trophy that year. When a player goes down, it gives the rest of the team the opportunity to step up and rise above the adversity. It will be interesting to see who takes that role with Kesler out of the lineup for a bit. I think it better that Kesler acts with precaution, coming back a little later than we all had hoped but fully capable of encompassing that #beastmode we all love to watch! At this moment Doan’s heart is Phoenix but he has officially stated that he will do what is best for him…even that means leaving the Coyotes franchise. So, once again we are left with the “I need more time to make this decision” announcement. It sounds as though Doan is divided, he may be on his way out of Phoenix but he also could remain loyal to the Coyotes. He has been visiting with other teams as he processes what is right for his future( a list that includes: New York, Philadelphia, Montreal, and Vancouver). Until the hockey world hears his official decision…all eyes around the NHL will remain on him, or until another dramatic move is made. In other news all of us fans are still waiting to hear any official word of agreement on the new CBA[Collective Bargaining Agreement] between the NHL & the NHLPA…because if you are like me…a year of no hockey(aka a lockout year) is absolutely unacceptable. The NHLPA has been reviewing the latest proposal by Bettman[Do Not get me started on Bettman!] and the NHL executives…but no word on its been seen as accepted or not. Keep your fingers crossed that both sides find a #winning agreement for both sides before mid-September so that we get hockey starting October 11th and not a year later!! Until next time, nuck said.